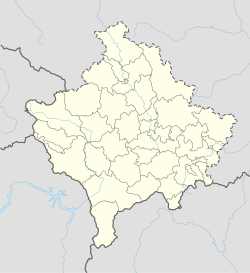 Banjska (Serbian: Бањска/Banjska; Albanian: Bajskë) is a village located in Zvečan in northern Kosovo[a]. It has a population of 465 inhabitants as of 2011. The Banjska monastery is nearby. In 1999 a RTV transmitter was damaged. During the Kosovan parliamentary election, 2010, a polling station was surrounded by an angry mob and access to the village was blocked. ^ "Banjska". GEOnet Names Server. ^ "† Манастир Бањска †". banjska.org. Archived from the original on 28 February 2008. ^ "Banjskë/Banjska. Shkolla Fillore "Banović Strahinja". Osnovna Škola "Banović Strahinja". 4. 29. Zvečan/Zveçan. 2913b. Zherovnicë/Zerovnica" (PDF). ^ "Serbs Divided on Kosovo Election Day". balkaninsight.com. This page was last edited on 8 September 2017, at 21:55 (UTC).